Avocent's AMX5110 desktop user station doubles as a monitor stand and provides access from the desk to the switch. The Avocent AMX5110 connects to the user's multi-platform KVM peripherals and sends the KVM signals over an industry standard CAT 5 cable to Avocent's AMX5000 matrix switch. 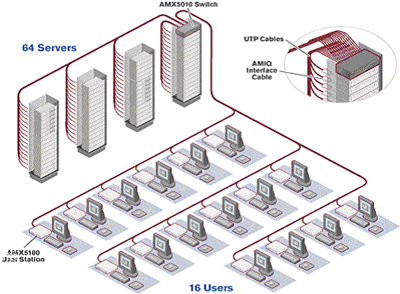 Avocent's exclusive AutoTuning technology allows the Avocent AMX5110 to automatically compensate for varying cable types and lengths, including CAT 5, CAT 5e and CAT 6 and adjust for signal losses each time a switch is made to a server. The Avocent Avocent AMX5110-AM user station works with patented OSCAR on-screen interface. OSCAR uses multi-lingual, intuitive menus for Point and Click system configuration and server selection. Question: Is there a replacement model for it? Answer: Thank you for your inquiry. The recommended replacement for the AMX5110-AM is the AMX5111-001 (https://www.kvm-switches-online.com/amx5111-001.html).